Tiramisu is a delicious Italian dessert made with zabaglione which is a light custard consisting of egg yolks, mascarpone cheese and a bit of sweet liquor, usually sweet marsala wine. Italian cookies called lady fingers are dipped in espresso and layered with the zabaglione and it is usually topped off with cocoa powder. In Italian tiramisu means "pick me up". Great name! Let me start by saying that there is no replacement for the original tiramisu. 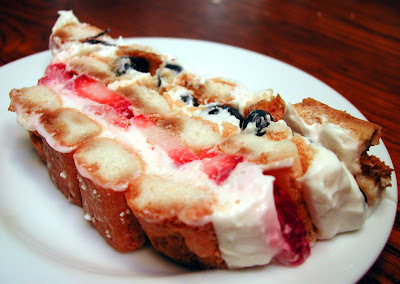 But this is a super easy, low-fat and delicious summer dessert that mimics the Italian classic. It's quick to prepare and serves as a lower calorie alternative to a traditional tiramisu. And I think it will definately pick you up! I am sending this over to Susan at Food Blogga who is hosting Sugar High Fridays this month for Jennifer of the Domestic Goddess, the creator of the SHF. Check it out for the most outrageously delicious berry concoctions. Mix the cream cheese to soften just until smooth and then fold in the yogurt and Amaretto. Line a loaf pan with plastic wrap, allowing the wrap to extend over the sides. In a wide, flat bowl, whisk the teeccino/coffee with the sugar. Dip 8 cookies into the teeccino/coffee one at a time, and arrange 4 in a single layer and another 4 in a single layer, on the bottom of the prepared pan. Spoon one third of the cream cheese mixture over the cookies to cover. Top with strawberries, reserving a few for the garnish. Repeat the dipping and layering of the next 8 cookies and cream cheese mixture, topping this layer with the blueberries. Dip the remaining 8 cookies in the teeccino/coffee and arrange on the top. Evenly spoon on remaining cream cheese mixture. (The top layer will extend a little above the pan sides). Cover with the plastic wrap and refrigerate at least 2 hours or up to one day. Unwrap the plastic and invert the tiramisu onto a platter and remove the plastic. Top with remaining strawberries and sprinkle with powdered sugar. Gorgeous!! Nice take on the traditional Tiramisu. I had the original tiramisu' when just started it was delicious and soon became popupar in Europe where it started all the way to U.S.I have to say I already tryed is very good and delish no left over.I dont think was Marsala wine in the orig.ciao Bambola. I have been keeping my eye out for a berry tiramisu. Looks delicious! So glad i found this recipe. i have some ladyfingers in my pantry too! I missed out on this..
Great idea for a summer sweet treat! I already feel picked up, and I haven't even tasted it yet! Thanks for the small-fuss, big-flavor tiramisu with berries, Annie. It's just perfect for a light and elegant summer dessert. Nice! 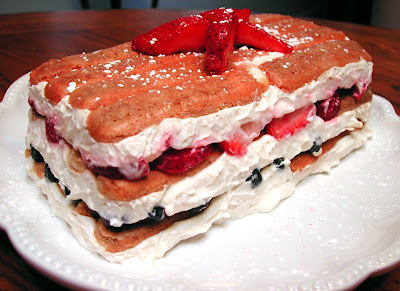 This is sort of like tiramisu meets berry shortcake. Yum! This looks so great...I love the berries in it. Great recipe, can't wait to try it!